Congratulations on buying your new home! As you move in, consider this. We only have a few short months of summer here in Indiana, so why not spend as much of it as you can outside? 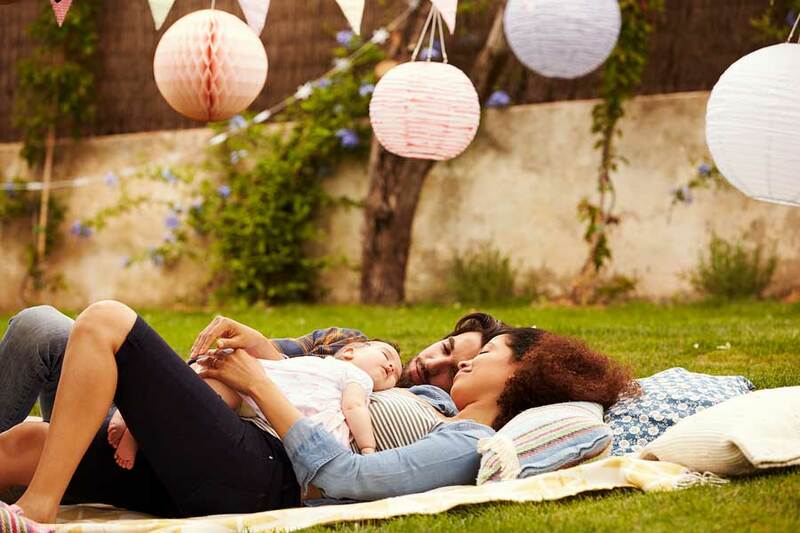 Now that you have a new place, this is your chance to create the outdoor living space of your dreams so you can spend that time in the comfort of your own yard. Go beyond the grill. Imagine cooking whatever you want for dinner in the coolness of the evening, as the sun is setting. All you need is the proper hardscape, appliances and plumbing for your new outdoor kitchen. This can be as simple or intricate, as small or as large as you want it to be. The point is, don’t cook inside when you could be spending more time enjoying your yard! As long as you’re creating an outdoor kitchen, you might as well have an outdoor dining area as well. The square footage of the area you need, the size of your table and number of chairs all depends on how many people you want to invite over. Or maybe you keep it small and simple, just for the family. One reason it’s hard to find a drive-in theater anymore is because it’s just way easier to step out into your backyard, pop a DVD (or better yet, a Roku stick) into a digital projector and have a backyard theater instead. All you need is the space to do it. Put the sleeping bag away. Don’t prop up the tent. Just climb into your new outdoor sleeping space! There are many ways people dedicated to outdoor living get their Zs, from outdoor daybeds to hammocks and their cousin, the hanging bed. Shut off as many lights as you can and get lost in the beauty of the heavens as you fall blissfully to sleep. You’re probably familiar with the classic ways people get exercise on their own property. Building an inground pool long enough for swimming laps is a popular one. But what if you just did all your indoor exercises – whether it’s weightlifting, calisthenics or core work with an exercise ball – outside on a well-manicured lawn? All you need are some privacy hedges around your workout area. This one’s pretty easy. You can do it with nothing but your basic camping equipment. What really adds to the fun, though, is a properly ventilated firepit of brick, stone or other material that can withstand heat. Of course, you will need to install it someplace that is attractive and not too close to your beloved plants. Do yourself (or us) a favor and make sure you can easily get the lawn mower around it, too. We believe enjoying the warm air, breeze and sunshine while you can is essential to living a better life. That’s why we offer both landscaping and hardscape services from design to construction to make your outdoor living dreams come true. Want more awesome outdoor living ideas for your new home? You know who you call!